Dr. Raj accepts the following list of insurance providers. Select your insurance provider to see more details. 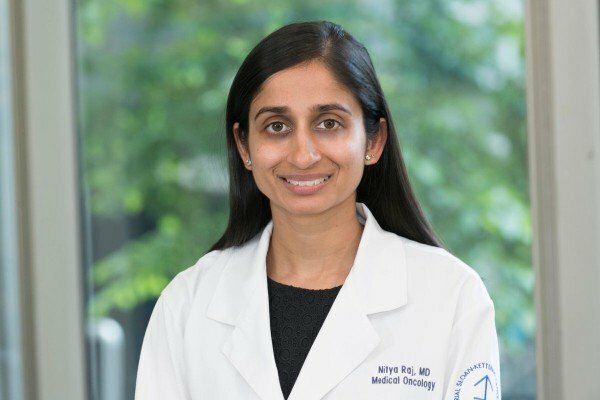 I am a medical oncologist whose clinical practice is devoted to caring for people with neuroendocrine tumors, colorectal cancer, pancreatic cancer, and other gastrointestinal cancers. I am part of a team of experts from different areas including surgeons, radiation therapists, and other specialists who share my goal of providing compassionate patient care. We work together to determine the best treatment plan for our patients. My research focuses on identifying new therapies for people with neuroendocrine cancers, a rare group of tumors that often begin in the body’s digestive organs. In addition, I am studying ways to improve our understanding of how neuroendocrine tumors change at the genetic level, both over time and as a result of different treatments. The goal of this work is to better personalize our care for people fighting these cancers. My research has been recognized and supported by the American Society of Clinical Oncology. Visit PubMed for a full listing of Dr. Raj’s journal articles. Pubmed is an online index of research papers and other articles from the US National Library of Medicine and the National Institutes of Health.